"After they settled in Rhodes the Knights of St John went on to take complete control of the island..."
When taking a cruise to Rhodes, you can’t go without hearing about the Rhodes Knights of St. John. Whether you’ll be wandering the streets of Rhodes on your own or taking a ship organized shore excursion, the Knights of St. John will be in your face all the time. 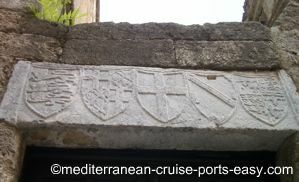 So we thought we would make it easy for you and put together some basic facts every Mediterranean cruise guest should know about the Rhodes Knights of St. John. The Order was first founded by monks in 1022 in Jerusalem. At first they were a religious group providing care for the sick and poor pilgrims to the Holy Places. After Jerusalem had been captured by the Crusaders in 1099, the Order then became a military organization under the church’s control and named the Order of the Knights of St John the Baptist (a.k.a the Knights Hospitaller). DINING-ROOM TABLE TIDBIT: The Order of St. John is considered to be the oldest religious order. In 1187, Jerusalem fell to Saladin and the Order left the city. After changing homes four times in two centuries (Jerusalem, Margat, Acre and Limassol in Cyprus), Rhodes became the Order’s fifth home in 1310. After they settled in Rhodes, first building a convent, the Knights of St John went on to take complete control of the island, soon also extending their power over nearby islands and even into Anatolia, Turkey. 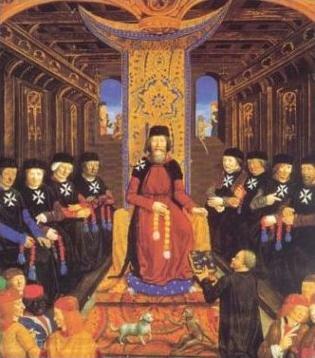 It’s interesting that in Rhodes, the Order became more of a maritime power, after employing the local seamen. Also, they became strong in commercial and diplomatic activities. DINING-ROOM TABLE TIDBIT: Members of the Order would spend the first half of the day in prayer and discussion on religious matters. The afternoon was devoted to work, recreation and military exercises. Late afternoon they would return to prayer, and finally retire at 7pm in the Winter and 8pm in the Summer. At midnight they would be woken up for Matins, the first prayers of the following day. The Order’s original costume was a black coat, a cloak with a pointed hood adorned with a little white cross on the left side of the chest and a golden cross in the middle of the breast. In war, the Knights wore armour and a red over-garment with a silver cross. 1. Knights, warring against the infidels, and protecting the pilgrims. 2. Priests, managing the spiritual affairs of the Order. 3. Brothers, servants entrusted with the care and nursing of the sick in times of peace, who served as inferior warriors in times of war. DINING-ROOM TABLE TIDBIT: All members made vows of Poverty, Chastity and Obedience. However the “Poverty” part only referred to individual poverty. The Order could possess wealth. Later on, some private possessions were allowed (e.g. equipment for a Knight), but after their death the property belonged to the Order! 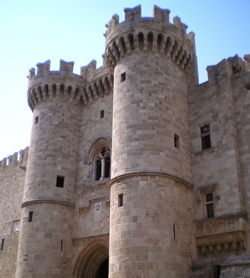 Over the years they gave Rhodes, especially the Old town of Rhodes, their own touch which can clearly be seen in its city walls, gates, castles, palaces and churches. Although the Rhodes Knights of the Order of St John have been given credit for numerous building structures in Rhodes, including around 30 castles, one of their biggest achievements was the building of the 4 km long walls and moat that completely encircle the Old town. Rhodes Knights of St. John’s supreme leader was the Grand Master and he resided in the Palace of the Grand Masters, also known as the Rhodes Castle of the Knights, which can be found at the end of the Street of the Knights which you can locate on our Rhodes map. The Order consisted of eight groups, which represented the major Catholic European countries of the time: Provence, Augergene, France, Italy, Germany, England and Spain (divided into Aragon and Castile). Each of these groups had their very own headquarters and places to meet and live, known as “inns” along the Street of the Knights. The Street of the Knights (Odos Ippoton) is one of the most fascinating sights to see in Rhodes Old town, and still shows you pretty much what it was like back in the Middle Ages. 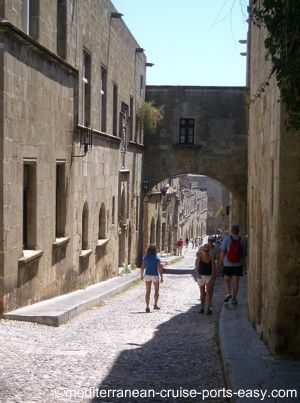 The Street of the Knights is a 200 meter long and 6 meter wide enchanting street, running all the way down from the Palace of the Grand Masters to the Hospital of the Rhodes Knights (today’s Archaeological Museum). It was the main official street connecting the religious centre, Catholic Cathedral (Panaghia Kastrou) and political centre of the fortress, the Palace of the Grand Masters. Although it’s often full of tourists and tour groups pounding its cobble-stoned pavement… by chance, you might sometimes find yourself being one of only a few souls wandering it. If so, well then you can really let your imagination soar even more, as you envision the many knights and their entourages roaming around, speaking their different languages and wearing their distinct coats of arms proudly. How interesting it must have been when they all had to rally to defend the city from attack! TIP: The Street of the Knights is all cobbled with small pebbles so make sure you wear flat and comfortable shoes! The Rhodes Knights of St John were in Rhodes for over 200 years, and after an ongoing struggle with the Turks and several of their attempts at taking over the city, the last Grand Master finally had to surrender power of the island in 1522 to the Sultan Suleiman the Magnificent.